In our previous article, we discussed important health insurance topics such as understanding deductibles and coinsurance. In part two we’ll go over two other important health insurance topics: copays and maximum out-of-pocket cost. 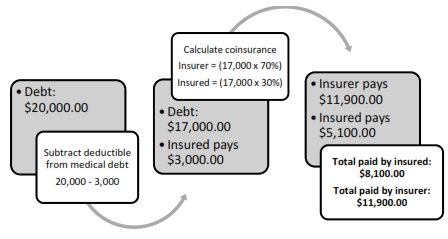 There will also be some math to show you how health insurance calculates medical cost shared between the insurer and the insured. A copay (also co-pay) is a flat amount that the policy holder pays either directly before or after treatment or service. Similar to low deductibles, policy holders often want health insurance that has low copays. Copays are usually not included in deductible pay-downs, coinsurance, nor maximum out-of-pocket. In addition, copay amounts vary depending on the type of service and whether you are in-network or out-of-network. Similar to deductibles, copays were put in place to prevent irresponsible behavior and free up medical providers to treat serious injuries or illness. However, the goal of copays is to be high enough to deter unnecessary medical care yet low enough to encourage essential medical treatment. The maximum out-of-pocket (OOP) cost is the most a policy holder will have to pay for medical treatment in a given period, which is often one year. Maximum OOP includes the amounts you had to pay for your deductible and coinsurance. Once you have paid up to your maximum OOP, your health insurance will cover the rest of your medical expenses 100%. As with deductibles and copays, a low maximum OOP is ideal. To give you a bigger picture of the math behind health insurance, let’s bring together everything we have learned: deductibles, coinsurance, and maximum OOP. We’ll construct two people, Person A and Person B, who have both accumulated $20,000.00 in medical debt. Both people have health insurance but with different deductibles, coinsurance, and maximum OOP as presented below. If you’ve suffered from a personal injury and have health insurance an experienced personal injury attorney will be able to answer any further questions you may have. Depending on the injury The Advocates can work with your health insurance to get your medical bills paid. We can make sure you get the compensation you deserve. The initial consultation is always free so give us a call today!